Nick and I started a summer tradition of attending “MetFridays” at the Metropolitan Museum of Art on the Upper East Side as a way to kick off our weekends. Each time we go, we come across a completely new gallery that we’ve never seen before! This visit we discovered free drawing classes that take place in different galleries around the museum. I must attend soon! For dinner, we grabbed food at Grazie, an Italian restaurant located near the museum. I had the buffalo mozzarella as an appetizer and wild mushroom ravioli as my main dish. It was so rich and delicious! Nick ordered the sausage and mushroom pizza…and fries. His meal still makes me giggle! On Saturday morning, I was back at the Met for my second interview for the museum’s volunteer program. After, I joined Nick in Central Park for some sunshine. Check out these cool things we spotted – a doggy fire hydrant and a group of people playing SpikeBall (featured on Shark Tank). I’d never seen or heard of it before but it looked like a blast! Plus, it seems to be pretty portable for the beach or park. We stopped at Starbucks where I spotted one of their new bistro boxes (I dig their protein boxes with cheese, an egg, apples, grapes, bread, and peanut butter!). This one was literally made for me – peanut butter and strawberry jelly sandwich, carrots and cucumbers with dressing, apple slices, and chocolate covered raisins. Is this real life?! We had a relaxing Saturday evening filled with the new Garnier Skin Renew face masks (my new favorite product!) 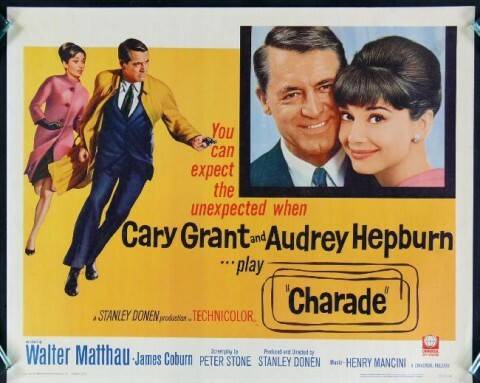 and Charade, a 1960’s classic starring Audrey Hepburn and Cary Grant. I love them both! Sunday morning, we woke up early to be some of the first in line to rent row boats in Central Park. We’ve tried to do this several times before this summer, but the line is always so long (tip: go first thing in the morning!). With the sunshine and light breeze, we couldn’t have asked for a better day to be out on the lake. After a morning of rowing, I was excited to take Nick to one of my favorite restaurants, Amused (previously known as Say Cheese) located on West 83rd Street. This farm-to-table restaurant is only open on the weekends and is cash only. They serve everything from gourmet grilled cheese sandwiches to salads to mini corndogs. It’s delicious! Nick and I both ordered grilled cheese sandwiches. I got the Swiss and Gruyere cheeses topped with apple compote washed down with rosemary lemonade. For dessert, we shared the “homemade” ice cream sandwich (with hopes of finding the golden ticket for a prize!) and the “Deconstructed Smores” which consists of a melted marshmallow rolled in graham cracker dust. It is served on the tip of a plastic tube filled with melted chocolate which you squeeze into the marshmallow as you eat it. I think I enjoyed it more than a regular smore! It’s definitely a lot less messy. That concludes my weekend. How was yours? Let me know in the comments below! Girl you know how to weekend! !